This page is dedicated to those who have passed away. If you know of any others please email us so we can honor their memories. Obituaries below are in chronological order. Our loving son, brother, grandson, and friend, Brice Edward Birchette, of Spanish Fork, passed away Tuesday, June 17, 2003 as a result of a tragic motorcycle accident. He was 17. Brice was born September 20, 1985 in Orem, Utah to Mark Edward and Elisa Danise Young Birchette. He attended school in Spanish Fork and at the time of his death was a junior at Landmark High School. He was employed as a tile layer and was a real perfectionist at his trade. Brice enjoyed roller blading, camping, and motorcycles. He also liked freestyling with friends. He was a member of The Church of Jesus Christ of Latter-day Saints where he was a teacher in the Priesthood. Brice is survived by his parents, of Spanish Fork; three brothers and three sisters: Daniel, Elric, Nicole, Randon, Bethany, and Maya Birchette, all of Spanish Fork. He is also survived by his grandparents: Grandma Maria Young, Grandma Sandra Bird, Grandpa David Bird; a very sweet girlfriend, Shelly; and so many people who loved him. Our special daughter, sister, aunt, and friend returned to her Heavenly Father on January 26, 2009. She was born April 25, 1986 in Provo, Utah to J. Lane and Leslie Money Henderson. She graduated from Spanish Fork High School. Amberly worked as a Veterinary Technician at Urgent Pet Care in Orem. She had a special love for animals and was kind and compassionate with them. Amberly was a National High School Rodeo All Around Champion and loved barrel racing, poles, roping, and cutting. Riding horses was a favorite activity. She also enjoyed sports, especially volleyball, basketball, and softball. Amberly was a caring friend to many and loved her family dearly. She was a member of The Church of Jesus Christ of Latter-day Saints. While we will miss our association with her greatly, we anxiously await the day we will again be together. She is survived by her parents, Lane and Leslie Henderson; sisters, Melissa (Adam) Gurr; Kimberly; brother, Travis; and her niece, Elliana. Amberly is also survived by her grandparents, Eldon A. and Sharlene Money; Maureen Henderson; as well as many loving aunts, uncles, cousins, and friends. She was preceded in death by her sister, Nicole; and her grandfather, J.C. Henderson. Our beautiful baby girl Breeann, passed away Friday, November 13, 2009 in Orem, Utah. Bree was born June 25, 1986, the daughter of loving parents, Blake L. Bowen and Grace E. Wagstaff Bowen. Her big brother Brandon welcomed his new little sister and the two of them were inseparable for years to follow. She later became the adorable big sister to Jake and Jorden. Bree and her three brothers were close as kids and friends for life. Breeann attended Spanish Fork High School and completed the medical assisting program at M.A.T.C. before graduating in 2004. In 2005 she met the love of her life, Dan Morrison. They were planning to be married in the near future. From music to good books to her love for her family and friends, Bree was passionate about life and her future. She had a wonderful sense of humor, a contagious laugh and an unparalleled gift for caring for others. She was a devoted daughter, sister, granddaughter, aunt, niece, cousin and friend. She was her mother’s rock and her daddy’s precious little girl. We love you so much Bree, and we will miss you everyday until we are together again. Bree is survived by her parents Blake Bowen and Grace Wagstaff Bowen; her brothers Brandon (Melissa) Berrett and Jake and Jorden Bowen; her grandmother Grace Rogers and grandfather Earl Wagstaff; her three nieces and many aunts, uncles, and cousins. She is preceeded in death by her grandparents Robert O. and Lucile Bowen and grandfather Bill Rogers. Tyrel was born to parents, Steven and Ruth Long, in 1985, on New Year's Eve giving everyone a reason to celebrate. He was a shining star with a larger than life personality and a sincere and golden heart. Everyone loved Tyrel, because they knew he loved them unconditionally and without reservation. Ty was an Eagle Scout. He was the champion and defender of the underdog. Ty excelled at everything he did. Tyrel had a strong testimony and read his scriptures daily to find the peace he needed. He was an excellent poet, artist, and athlete. Tyrel was blessed with a smile that lit up his whole face. His beautiful blue eyes and dimples disguised a irrepressible mischievous streak. He loved to laugh, adored his family, his dog, Jezebel, and everyone he knew. Tyrel chose to move on to his next adventure, January 2, 2010, leaving us with broken hearts, but great anticipation of a glorious reunion. He leaves behind his parents, Steven and Ruth, brother, Matthew, and sister, Elaine (Ben) Cloward and his first niece, Karlee. He also leaves behind many cousins, aunts, uncles, and grandparents who are struggling to go on without his light. Aaron Thomas Davies, age 25, passed away March 4, 2011, at his parents' home in Spanish Fork, Utah. Aaron was born March 11, 1985 to Ted and Kaye Davies. He was a loving son, brother, uncle and friend. He was a very passionate person, always giving his fullest effort. He loved his family and in his free time, you could find Aaron playing with his nieces and nephews and spending time with his family and friends. Aaron achieved the great honor of being an Eagle Scout. He graduated with honors from Spanish Fork High School in 2004 where he played football, basketball and was on the track team and received 9 athletic letters. Aaron was a four year LDS Seminary graduate and was called to serve in the Tacoma, Washington Mission. Aaron attended Dixie State on an academic and athletic scholarship where he played football. He was a Resident Assistant for the on-campus housing for one year and the following year the Head Resident Assistant over all on-campus housing activities. He was a senior at Dixie State and planned on receiving his bachelor's degree in Business Management. At first meeting, Aaron was quiet and reserved, but his true self was a natural salesman. He worked for Simplicity Group for five years as a salesman and manager of online sales, in which he was very successful. Aaron loved to be involved in activities with his family and friends. He spent summers fishing, river rafting and four wheeling. He liked to trap shoot with his dad and friends, and play games with his friends, and vacation with his family. He was very active, playing any sport he had the opportunity to play. His fun loving personality will be dearly missed. He is survived by his parents, Ted and Kaye Davies; grandparents, Tom and Ileena Davies and grandfather, Arthur Roy Halladay; sisters, Rachelle (Seth) Sorensen and Melissa (Josh) Lee, brother, Ben Davies; five nieces and two nephews. He was preceded in death by his grandmother, Karyl Halladay. Our sweet Alissa Debra Sue Stremke has left this world, less her ray of sunshine on October 6th 2012. Mother of two beautiful children, Nash (7) and Avanley (3), Daughter of Martine Savageau and the late Richard Layton- Leonard Stremke, sister and friend to many whose lives will never be the same without you. You were the best mother and your perseverance was unshakable. The example that you displayed to everyone you met was to live and love and never give up on those you believed in. Your contagious smile is ingrained in our souls and we will never stop hearing the echoes of your laugh in our hearts. Alissa, you are the brightest star in the skies now. There will be many lifetimes lived in your reflection. Bradley Scott Newman died in the early morning hours of August 30, 2013, at Mountain View Hospital in Payson, Utah, where he was surrounded by his loved ones. He died as a result of an insidious addiction. The tragedy continues for his family who mourns his early passing; however, some peace is found in knowing that God has set him free from this earthly demon that robbed him of so much. Bradley was born August 8, 1985, in Vernal, Utah, to Kelly Ann and Scott Newman. He had an older brother, Adam Robert, waiting anxiously for his birth, and they became life-long companions. Later the family moved to American Fork, Utah, then eventually to Roseburg, Oregon, where his father's work took them, in time they settled back in Utah. Brad will be remembered by his infectious smile, his ability to light up a room with laughter, and his calming ways. He was happiest being in the outdoors where he enjoyed hunting, camping, and fishing in Alaska with his father. Brad graduated from Pleasant Grove High School in 2004. He continued his education with a four year apprenticeship through Five States Apprenticeship Program becoming a journeyman lineman, following in the footsteps of his father, Scott, and grandfather, Robert Newman. He then proudly worked through the contractors of IBEW Local 57. His employment has taken him to many areas of the country where he's left a life-long impression of his great character and excellent work ethic with the people he met. He is survived by his wife, Emily Dawn and children: Emma, Preston, Ayden, and Maxwell. He is also survived by his parents Kelly and Darren Hooley of Pleasant Grove and Scott and Serena Newman of Petersburg, Alaska, and brothers Adam (Candace) King and younger brother Logan Hooley, step sisters Heather (Jay) Rayborn and Elizabeth May Erickson; grandparents: Robert and Carolyn Newman, Richard and Frances Reiser, and Doug and Jerri Hooley, great grandmother Dorothy Newman Breeze and special uncle and aunts: Steven Newman, Kathy Johnson, Barbara Newman and cousins Rachel, Travis and Trevor Beck. He was preceded in death by his grandmother Sharon Ann Newman. 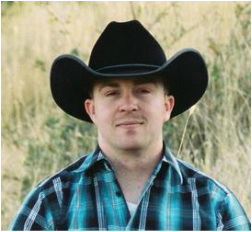 Our hearts are broken because, our “Man From Snowy River”, Bryce Wayne Ehlert, 29, was called home on Sunday, November 2, 2014 due to complications from his fourth open-heart surgery for a congenital heart defect (truncus arteriosus) and advanced heart failure. He grew up in Provo and Spanish Fork, graduating a “Don” with the class of 2004 from Spanish Fork High School. He was employed as a phlebotomist for ARUP Labs at the University of Utah Hospital in Salt Lake City. Bryce only wanted to be a cowboy when he grew up. He loved the outdoors, his 3 dogs, 2 goats, horses, cowboy boots, cowboy hat, motorcycles, ATV's, camping, hiking, fishing, driving, family gatherings, barbecues, board games, the small town of Coalville, and spending time with his wife. On 10-11-12, he married the love of his life, a cowgirl and championship barrel racer, Nadine Lynn Kern. He cherished everyday he spent with her! Bryce leaves behind his parents, Alan and Sara Cox Ehlert, 1 brother, Cameron Ehlert, 1 sister, Sheena Sargent, his wife, Nadine Kern Ehlert, his in-laws, Wanda (Coal) Busch, and Jeffrey (Kathy) Kern, and grandparents Orville C. and Ines Cox of Shelley, ID. Viewing and funeral services will be held at the Coalville LDS Church, 40 N Main, Coalville, UT 84017. Viewing is Thursday, November 6, 2014, from 6-8 pm, and again on Friday from 11:45-12:45 prior to services. Funeral is Friday, November 7, 2014, at 1 pm. Interment will be at the Coalville Cemetery immediately following. In lieu of flowers, donations can be made at any Wells Fargo bank, “Bryce Ehlert memorial fund”. Bryce lived full throttle! We will miss his energy, wit, storytelling, red-neck jokes, barbecues, and cowboy poetry.